Can you help Owen get to the BWF Para-Badminton World Championships in South Korea? Owen Kilburn is hoping to raise £600 to help fund travel and accommodation expenses for the BWF Para-Badminton World Championships in South Korea 20th-26th November 2017. Click here to access Owen's 'Just Giving' crowdfunding page. "Owen is a very talented, positive and determined individual whom I have known for many years. If like myself you would love Owen to achieve his objective of representing England at the BWF Para-Badminton World Championships in South Korea, please feel free to both support his fund raising efforts and / or contact him directly. Good luck and best wishes Owen." I was born in Nottingham with a disability known as Spina Bifida. As a child sport was never really on my mind as I had no idea what was out there for those with disabilities like myself as a full time wheelchair user. My first taste of wheelchair badminton was with a club called Nottingham Blazers, setup by Elaine Spray in 2005. At first I was very reluctant to go but my Dad eventually persuaded me to at least go try it out. The quick pace of the game and how tiring it could be was very surprising, but I immediately fell in love with the sport and I was naturally quite good at it and picked up the techniques pretty quickly. In August 2007 I entered my first competition, the 4 Nations Disability Badminton Championships in Cardiff. Although I didn’t manage to win a game it was a massive learning experience playing against players from around the UK and some of National/International standard. It was the 4 Nations Disability Badminton Championships in 2008 where I managed to win my first medal coming runner-up in the wheelchair mens doubles. Over the next few years I had kept on improving, winning my first 4 Nations Gold medal in 2009 in the mixed doubles with former Notts Wheelchair player Paula Robinson. 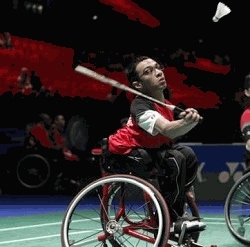 Around this time disabled Badminton was rapidly growing in the UK and the 4 Nations became a series with 4 tournaments being held a year in each the home nations (England, Scotland, Ireland & Wales). I entered my first International competition in 2011, the German Open International, which was another very big learning curve and at the end of 2011 I repeated my treble feat in the 4 Nations Championships. In January 2012 I was selected by Badminton England to be a member of the first official England Para-Badminton squad. I continued to play in both the 4 Nations and International competitions, including the Para-Badminton European Championships in 2012, 2014, and 2016 and Para-Badminton World Championships 2013 and 2015. Para-Badminton is now a Paralympic sport and will make its debut in the Tokyo 2020 Paralympic Games. Para-Badminton continues to grow rapidly both domestically and internationally as the games draws ever closer, with the World Championships being hosted in Ulsan City South Korea on 22nd – 26th November 2017. Even though I represent my country at International level, all players have to 100% fund themselves for tournament entry, flights and accommodation. So I’m looking for support in the form of small donation to help continue my dreams, goals and aspirations via the JustGiving Crowdfunding page. My kit is currently sponsored by Babolat and coached at Notts BA performance centre at Chilwell Olympia. 3. Continue success at International competitions – ultimately winning a title. To email Owen directly click here.